For me it's a winner and long may they continue to put out albums of this quality. When a new Unruly Child album appears on the release sheets, before I've even heard it a smile like that of the Cheshire Cat spreads across my face. 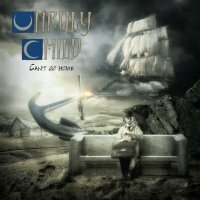 'Can't Go Home' is the title of this new release and it's a slightly different kind of album to the one that I was expecting. There's a more laid back, slow burning and subtler feel to it than on previous releases, but it is as good as anything they have recorded before (with maybe the exception of the first album). All the band members are on fine form; however, I must give a special mention to Bruce Gowdy whose guitar work is wonderful throughout. Then of course there is "that" voice, the one that belongs to Marcie Free. As you listen to this release you'll soon find the songs have all the usual UC trademarks that you've come to expect from the band, such as strong melodies, stellar musical performances and luxuriant vocals, all of which are present in abundance. 'The Only One' launches the release and it's a fine Hard Rockin' song to begin an album with. The album flows along with the likes of 'Four Eleven' which sees Free doing a bit of a Robert Plant thing on the chorus, 'Driving In The Future' where Gowdy solos like a God, the mid-paced Rocker 'Get On Top' with its nice hook that harks back to the first album and 'See If She Floats' which has another great Free vocal, complimented by a strong chorus and some wonderful harmony vocals. 'Point Of View' is another offering that has echoes of early UC running through it, 'Ice Cold Sunshine' is a brooding Rocker with some wonderful musicianship whilst the up-tempo 'When Love Is Here' has a Poppy feel to it. Lastly there is 'Someday Somehow' where the whole band Rock things up, with Free, Gowdy, Guy Allison, Jay Schellen and Larry Antonio all pulling together to create a superb powerful attitude-filled Rocker. Many still lament the passing of the debut UC album, which is twenty-five years old now, and wish that the band would re-record said album over and over. Others realize that Unruly Child have grown older and wiser over the years and this is reflected in their new album and its songs. For me it's a winner and long may they continue to put out albums of this quality.